J.E.T. orig. FEDE, SPERANZA, CARITA lp SUPER RARE ITALIAN PROG MONSTER! PLEASE NOTE BEFORE BIDDING ON MY EBAY ITEMS**Due to the timing of this current auction there may be slight delays due to holiday schedule. I will do my best to ship things out as promptly as possible however! I make a concerted effortto grade conservatively and my feedback reflects this. Payment is expected in 3 days. If you need a bit more time, please contact me. Vinyl and inner sleeve are are always removed from jacket and are always put in protective plastic sleeve to protect jacket from splits in preparation to ship.Buyers with less than 20 feedbacks should contact me before bidding for approval or your bid may be cancelled! 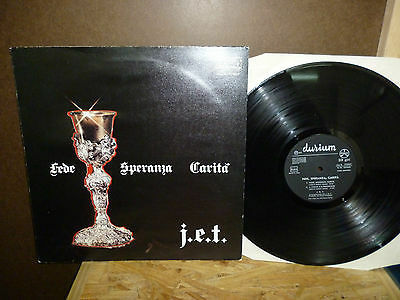 Up for grabs is an amazing and super super rare ORIGINAL ITALIAN 1ST press of a superb prog monster of an lp by J.E.T. entitled FEDE, SPERANZA, CARITA (DURIUM MS A 77307. 1972). **THIS 100% ORIGINAL PRESSING & NOT A REPRESS OF ANY KIND!! AWESOME ORIGINAL DIECUT GATEFOLD JACKET (WITH AMAZING RAISED CHALICE) IS IN VG TO VG+ CONDITION; SOME MODERATE CREASING AROUND THE DIE-CUT AREA ON FRONT OF JACKET, MINOR CORNER DINGS/FRAYING, MINOR SPINE/SEAM WEAR, MINOR SCUFFS, STAINS & FAINT RINGWEAR FRONT/BACK OF JACKET. REALLY GREAT CONDITION FOR IT'S AGE!! VINYL IS IN VG+ TO VG++ CONDITION; A FEW SUPER FAINT RUB MARKS, VINYL IS SUPER CLEAN/SHINY, LOOKS/PLAYS GREAT WITH FAINT SURFACE NOISE! AMAZING CONDITION FOR THIS SUPER SUPER RARITY! **BE SURE TO CHECK OUT THE OTHER CRAZY SUPER RARE PROG & PSYCH RECORDS I HAVE UP FOR AUCTION RIGHT NOW! UNEARTHING STUFF FROM MY VINYL ARCHIVES TO MAKE MUCH NEEDED CASH! MY LOSS IS YOUR GAIN! YOUR MIND WILL BE BLOWN!! Recording: Made in USA. Stereo. Jacket condition: Sealed. Store stock new! No cutouts, punch holes or clips. Notes: Out of print Classic Records 50th Anniversary Lp Series issue in 180grams. I will be listing a lot of rare, sealed lps from the 90s and 2000s in the next few weeks so check back or bookmark. Original releases and audiophile recordings included.